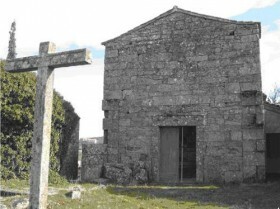 For three centuries, this site, located in the remote village of Vilar de Perdizes in North Portugal, provided material and spiritual comfort to numerous pilgrims to Santiago de Compostela. The village was strategically located at the centre of many alternative paths to Santiago, and was also an important shortcut. Established in 1555 through a Papal bull, the site included a hospital, a pharmacy and a chapel. The Paço de Vilar de Perdizes remarkably integrates 16th century, Baroque and Mannerism elements. The manor house comprises eight large salons per floor without linking corridors, as was characteristic in the 16th century. 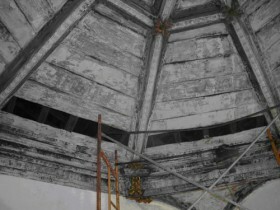 Its collection of eight coffered wood ceilings from the 18th century is considered to be unique in Portugal. The chapel is decorated with 17th century artistic tiles (azulejos). The hospital, the pharmacy and the chapel are today in an advanced state of decay, while the manor house is seriously endangered due to the instability of its foundations. The renovation of the site to host a museum and an interpretation centre would help develop tourism activities and revitalise the Santiago route in the region. The Paço de Vilar de Perdizes often receives requests to be visited by schools and groups with various interests. The restored site could help introduce or reinforce networks of specialist tourism (architectural, archaeological, military and nature tourism) in the region. The Route of Santiago de Compostela played a crucial role in encouraging cultural exchange between the Iberian Peninsula and the rest of Europe during the Middle Ages and remains a testimony to the power of the Christian faith among people from all over Europe, according to UNESCO. It was proclaimed the first European Cultural Itinerary in 1987. 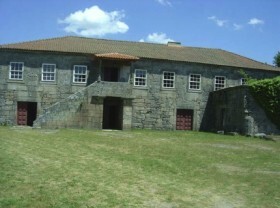 The Associação Portuguesa das Casas Antigas nominated the site for ‘The 7 Most Endangered’ 2014.